Texas legislators are burning with reefer madness as 63 cannabis reform bills have been submitted for the 86th legislative session. The topics range from reduced sentences for possession charges to the legalization of medical marijuana. Heather Fazio, director of Texans for Responsible Marijuana Policy, has been advocating for marijuana reform in Texas since 2014. Since then Texas has taken baby steps at marijuana reform, but medical access is still limited to patients suffering from intractable epilepsy, which affects roughly one-third of epilepsy patients, according to Stanford Health Care. Being caught with small quantities of the plant could land a person in jail for up to six months, which is another issue lawmakers are hoping to change during this legislative session. So far, the issue has gained traction on both sides of the political aisle, but advocates still face opposition from law enforcement agencies. “Public safety issues being experienced by law enforcement officials in states where marijuana has been legalized, reinforce our belief that the further legalization of marijuana in Texas is not appropriate,” Collin County Sheriff Jim Skinner said. According to Eastfield sociology professor India Stewart, the further legalization of marijuana in Texas is not something that people should be alarmed about. Texas law currently allows for the use of low-THC cannabis for patients suffering from intractable epilepsy, a serious type of epilepsy where medication does little or nothing to control the seizures. Known as the Compassionate Use Act, the bill was proposed by Rep. Stephanie Klick (R — Fort Worth) in 2015 and was signed into law by Gov. Greg Abbott. The bill limits cannabis to a THC content of no greater than 0.5 percent and a cannabidiol content of no less than 10 percent. According to the National Institute on Drug Abuse, the average THC level of marijuana was around 12 percent in 2014. The bill also required the Texas Department of Public Safety to create a registry for physicians treating epilepsy and required the department to license three distribution sites in Texas by Sept. 1, 2017. One of those three sites is Compassionate Cultivation in Manchaca. Dispensary manager Kelsey Richards said that even with the tight-grip regulations, she believes it is the smartest way for Texas to regulate marijuana. Thirty-three states have laws that allow citizens access to medical marijuana, but Texas is one of 12 that only grants access to low-THC content cannabis. Tetrahydrocannabinol, better known as THC, is the psychoactive ingredient found in marijuana that produces the high that users experience. Marijuana is still a Schedule 1 drug under federal law, meaning the federal government does not recognize any potential for medical purposes. However, the passing of the Farm Bill in 2018 by President Trump made hemp (containing no more than 0.3 percent THC) legal across the United States. Since then, various shops around the Dallas-Fort Worth region have begun selling CBD oil. While hemp was made legal federally, Texas law states it can only be prescribed to intractable epilepsy patients, so anyone who purchases CBD oil from a shop or online without a prescription is breaking the law. Anyone in Texas who is caught with 2 ounces or less of marijuana can be charged with a Class B misdemeanor, which could result in up to 180 days in jail, a $2,000 fine and a driver’s license suspension for 180 days. Some municipalities, including Dallas, have passed laws that issue a citation for anyone in possession of certain amounts of marijuana. Beginning in October 2017, Dallas police officers were given the choice to write a citation for anyone caught with less than 4 ounces of marijuana. The law would still require the person to show up to court, but would not require the officer to arrest the person on the spot. The law does not apply to students at Eastfield, though, since the campus is located outside of the city of Dallas. Fazio, the advocate for fewer restrictions on marijuana, and her group are working diligently to get the ball rolling on cannabis reform before the legislative session ends May 27. While her organization supports many of the proposed bills, Fazio said the group is putting the bulk of its resources into four bills: House Bill 63, House Bill 1365, Senate Bill 90 and Senate Bill 156. Of the four bills, House Bill 63 and Senate Bill 156 are both aimed at sentence reduction for small amounts of cannabis and related drug paraphernalia. House Bill 1365 and Senate Bill 90 are pushing for the further legalization of medical marijuana. All four are supported across the political spectrum, Fazio said. Marijuana reform in the 86th Legislature of Texas has brought groups like Texas Young Republicans together with those that are typically more liberal, such as Progress Texas. 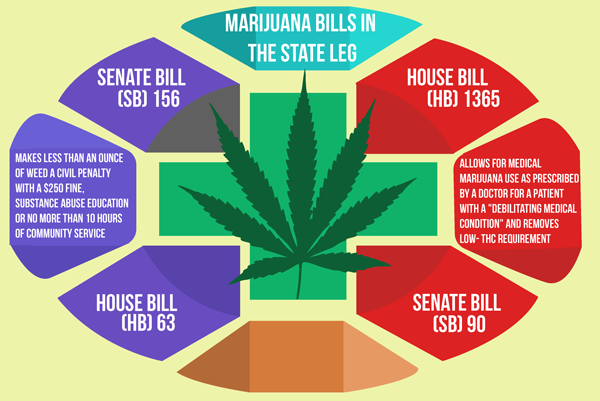 Jason Vaughn, policy director for Texas Young Republicans, is not as hopeful that some of the bills will pass, including Senate Bill 90, because the bill allows for marijuana to be smoked rather than administered in other ways. He is confident however, that legislators will pass bills to reform civil penalties, industrial hemp and medical marijuana. While people like Fazio and Vaughn are trying to stay positive, Eastfield government professor Cindy Castañeda is more pessimistic about seeing any real change this legislative session. While lawmakers may hold bipartisan support for marijuana reform, law enforcement groups like the Sheriffs’ Association of Texas have a different viewpoint. Skinner, who is director of the Sheriffs’ Association, said the group is opposed to the further legalization of marijuana in the state. Skinner also said there have been issues with law enforcement in states that have begun legalization, which is another reason the association is against any further changes to cannabis laws in Texas. Stewart doesn’t see the justification in using public health concerns as an excuse, when things like alcohol and driving cars are also a hazard to the public. Fazio, on the other hand, believes the opposition from the Sheriffs’ Association is fear of marijuana becoming legalized, but none of the proposed bills in Texas are calling for open legalization. While Fazio said the Sheriffs’ Association may have a clouded understanding of what is currently trying to be passed in Texas, Vaughn said what’s not clouded is their relationship with Lt. Gov. Dan Patrick and Gov. Greg Abbott. “The lt. governor and the governor will often side with the Sheriffs’ Association,” Vaughn said. While Abbott in recent years has supported decriminalizing charges against possession of marijuana, Patrick has spoken out against reform and has the power to block any of the proposed bills coming out of the Senate from reaching the governor’s desk. “Even if they were lucky enough to get something out of the Senate, which I don’t think that they will, it would be 100 percent likely to be vetoed by the governor,” Castañeda said.